The village did not stand completely empty, as Nhaqosa had first suspected. In the centre of the village, in the commons of the village green, the grass now brown around a well, a couple of unkempt men sat at a rough-hewn table, a jug of liquid between them. Their talk ended abruptly at the appearance of Nhaqosa. They stood in surprise, the benches they had sat on falling over and hands going to weapons. “I would speak to whoever is in charge here,” Nhaqosa sternly announced in the tones of one who would brook no dissent. One nodded nervously, darting into the building they had been seated out front of, a building of stone, a touch statelier than the crude wooden hovels that formed the rest of the village. The second man stood staring at Nhaqosa, his face a touch pale and eyes widened. 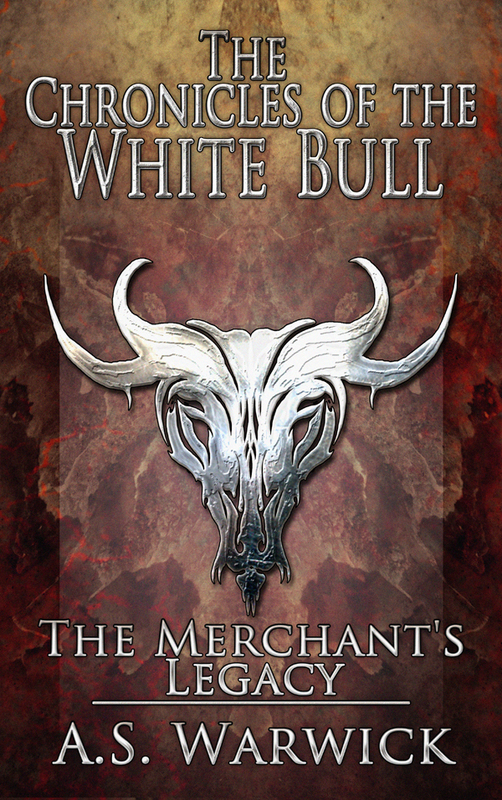 He swallowed hard, knuckles white as they gripped the shaft of his rusty spear. Nhaqosa planted the head of his maul upon the ground, folding his hands on the handle and waited. Occasionally his tail slashed or an ear twitched, driving away an errant fly, but beyond that he stood unmoving as a statue. The wait lasted for some time, the only sound to be heard the buzzing of flies, and, at one stage, the creak of a door as it swung on its hinges in a faint breeze. Finally a number of men emerged from the building, in the middle of them one all in dark robes, his hood pulled up over his head so that his features were hidden. The robed figure walked to the fore as they approached, pushing by the other bandits, all of who hung tentatively back from Nhaqosa. The robed man looked at Nhaqosa from within the depths of the hood, studying the minotaur until, at last, his curiosity satisfied, he spoke. “What manner of beast are you?” it asked, and at those words Nhaqosa knew that what stood before him was no man. The voice had a sibilant rasp to it, a sound of echoes within echoes that set off a disturbing resonance through Nhaqosa’s body and brought an uneasy chill to his flesh, setting it crawling. Nhaqosa felt a heavy chill run through his limbs at the gesture, weighed down as if beneath the burden of a thousand years, the maul heavy on his shoulder, knees almost giving way beneath him. He growled, trying to shake the lethargy that had taken a hold of him. Slowly he stepped forward, towards the creature. “Neither am I,” he replied with ominous foreboding. On the features of one so inhuman, expressions were hard to read. If anything, though, Nhaqosa felt that it showed shock at his words and actions, even a touch of fear in those black eyes. “Kill it,” the grey creature hissed, backing away from Nhaqosa, gesticulating for the bandits behind it to attack Nhaqosa. As it did so, the heaviness that afflicted Nhaqosa’s limbs began to slough away. The first man, braver than most, ran screaming at Nhaqosa, holding a rusty axe high. The weight upon his limbs gone, Nhaqosa swung the maul down from his shoulder and vented forth an almighty roar of pure rage. The blow slammed into the man’s side, shattering ribs under the impact and driving the shards of bone deep into his internal organs. The chest caved in and the body flew aside like a broken doll. Nhaqosa began a deliberate, slow stalking walk and the bandits scattered aside rather than risk venturing into the reach of his terrible maul, leaving the creature alone to face down the white minotaur. It scrambled back further, around behind the table, seeking to put it between itself and the enraged minotaur that came for it. Nhaqosa brought the maul slamming down again and the table shattered into shards beneath the force of the blow. He kicked aside the wreckage and continued his grim, methodical advance. The creature grabbed a bandit who stood nearby and shoved him bodily into the path of Nhaqosa. The minotaur contemptuously batted the man aside with his maul as one would a fly, throwing the man to the ground to where a pool of blood began to spread outwards from his ruined body. Then, unexpected, from behind a man yelled a challenge and rushed at Nhaqosa with a levelled spear. Nhaqosa half turned to meet the oncoming attack. As he did so, the pallid grey creature darted forward to grasp his left arm, clawed fingers digging deeply into the white hide so that blood seeped out and showed crimson against it. Nhaqosa bellowed a roar of anger and frustration at the touch, feeling his strength seep from his arm once more. Echoing, mocking laughter from the hairless creature accompanied it. The weight of the great maul in his hands became too much to support and it dropped from his grip, to land clattering upon the ground. The spearman came on, aiming to drive his spear home into Nhaqosa’s broad back. Nhaqosa turned, with barely enough strength left to grasp at the spear shaft as it thrust towards him, halting it just before it plunged into him. He exerted himself as he snapped the spear shaft just beneath the head, throwing the end away and following it up by punching the bandit full in the face. The man staggered back, dazed and bleeding from a battered nose and crushed lip, yet still standing from a blow that would normally have felled any man it hit. The other bandits, sensing Nhaqosa’s vulnerability as the grey creature continued to drain his strength, started to close in. Vicious smiles creased their lips. Nhaqosa tossed back his head and called out with as much strength as he could still muster. “To me!” He reached down with his right hand and grabbed the wrist of the creature beside him. Clenching his teeth and straining muscles fair to burst, cords standing out beneath his hide, he sought to pull free the clawed hand that dug deep into his flesh. From beyond the commons, called in by Nhaqosa’s yell, the escaped gladiators emerged, spilling into view, charging forward with weapons to hand. A crossbow bolt split the air and one bandit, poised ready to drive a sword into Nhaqosa’s neck, went down as it transfixed him through his neck, gurgling blood as he crashed to the ground. The bandits turned to face the fresh threat, leaving Nhaqosa to the unholy mercies of their dark master. Screaming insults, they charged at the oncoming gladiators. The singing and clash of blades rang out as the two groups collided with a vicious impact, cries and screams echoing about as blows struck home. Nhaqosa’s band sought to hack a bloody path through the bandits to reach his side, while the bandits fought back with reckless fanaticism, sensing in this fight that no quarter was to be expected, or given. “Kwaza!” Abasan screamed in wild fury, “Kwaza!” He disembowelled one foe, blade viciously ripping the bandit open to spill forth entrails. The man desperately tried to hold them in as he staggered away, his high-pitched anguished squeal loud above even the sounds of battle. Abasan, following up, hacked him down and pushed on. Anaother man received a punch in the face with the hilt of Abasan’s sword as he tried to reach Nhaqosa. Ears ringing with the pounding of his blood, Nhaqosa barely heard him, or the din of the fight. The nails dug into his flesh were being torn loose agonisingly slowly. The grey creature raised its other hand and about it dark eldritch mists began to coalesce, a black mass of foul energies through which swirls and sparks of deep purple lightning flashed. Raising the mass, the creature drove it into Nhaqosa’s chest and the minotaur screamed as pain unlike any he had experienced before hammered at his body. Before him, everything blurred and darkened, bright points of light swirling in his vision. His heart pounded erratically and sweat poured in torrents from his body. Knees began to buckle beneath him under the agony tearing him apart. In desperation he did the one thing he could, more from the instinct of self-preservation than any conscious thought. Screaming incoherently, he brought his head up and then drove it down, his broad forehead slamming with every last ounce of strength he could muster straight into the face of the monster that unleashed its dark powers upon him. The grip on him tore free as the creature staggered back under the blow, stunned by both the resilience and ferocity of the enraged minotaur as much as by the attack itself. Nhaqosa slowly rose to his full height again, like a building wave ready to crash upon the beach, towering above the grey creature. He slammed a brutal kick at it, its knee shattering under the impact of the strike. The creature fell over, shrieking and writing as it clutched its ruined knee. Nhaqosa purposely stepped forward to stand above the grey-hued creature, staring down at it with resolute purpose. “Your foul deeds end here,” the minotaur announced. A cloven hoof rose high and then stomped down with brutal precision. The creature’s skull shattered beneath it. Walking back over to his fallen maul, Nhaqosa recovered it and turned back to the fight that had raged throughout the commons. It had ended already. The bodies of the bandits lay strewn all around, broken and rent, though they were not alone. A cluster of his band gathered around the fallen form of one of their own. Still aching in every part of his body, Nhaqosa walked over to join them. The fallen was Alyan, lying in Lakach’s arms, his eyes staring at the sky lifelessly. “What happened?” Nhaoqsa asked quietly.